How to crochet a triangle granny shawl!! Row 1: make a slip knot, chain 4, join with 1sc into the 1st chain to form a ring. Chain 4, 3 dc into the ring, chain 2, 3dc into the ring, chain 1, 1dc into the ring. Row 2: chain 4, turn, 3dc into the 1st space, chain 1, 3dc into the middle space, chain 2, 3dc into the same space, chain 1, 3dc into the last space, chain 1, 1dc into the same space. Row 3: chain 4, turn, 3dc into the 1st space, chain 1, 3dc into the next space, chain 1, 3dc into the middle space, chain 2, 3dc into the same space, chain 1, 3dc into the next space, chain 1, 3dc into the last space, chain 1, 1dc into the same space. When you have the size you want cut the yarn and finish your work. 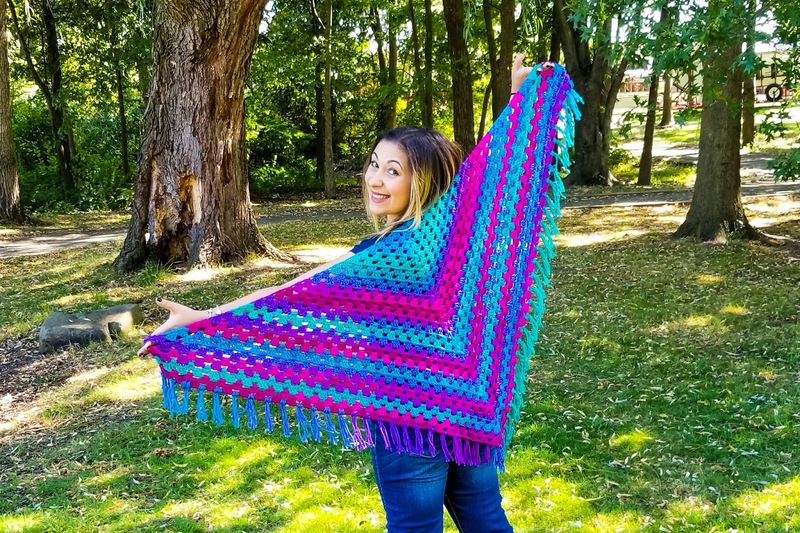 Please watch my free video tutorial witch shows you how to make this beautiful shawl step by step and how to add fringe!! !